Florida Lottery drawings are conducted under the strictest security guidelines and procedures in the industry. A Special Agent (sworn law enforcement officer) serves as the draw manager and an auditor from an independent auditing firm attends and participates in every single drawing, 365 days a year. The draw equipment is located in a secure vault and is housed at the Lottery Headquarters building, which is a secure and limited access facility, monitored 24 hours per day by Security Officers and video surveillance. As part of our detailed pre-draw procedures the draw manager and independent auditor complete a lengthy checklist that thoroughly scrutinizes all aspects of each drawing. There are multiple draw machines and ball sets available for use at any particular drawing. The draw machine and ball set for each drawing is selected at random just prior to the drawing. Ball sets are weighed on certified electronic scales before and after each drawing to ensure that there has not been any tampering and a series of pre-tests are also conducted to ensure the machines are working properly. All Florida Lottery drawings are open to the public for viewing from the Tallahassee Headquarters Studio. If you are interested in attending a drawing, please contact the Division of Security at (850) 487-7730. 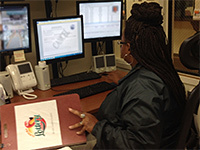 Security Officers for the Florida Lottery operate and monitor surveillance, closed circuit camera, and alarm and intrusion detection systems for Headquarters and all nine district offices. Also, they provide escorts for visitors, delivery and service personnel, and issue temporary visitor and service I.D. badges with accurate completion of the log forms at the time of issuance. They respond to lost and stolen ticket reports from retailers, ensure new employees receive a photo badge and process Amber/Silver Alerts.